At Craig, we take great pride in supporting not only our patients, but their families as well. Our Family Housing department offers a wide variety of programs specifically designed to support both outpatients and families of inpatients in our on-site family housing facility. At times, however, the number of families we need to serve exceeds our available on-campus housing and we must look to local hotels or other resources to support our housing needs. One unique relationship with Brookdale Meridian Englewood, a local senior living community, located just a few blocks from Craig, allows us to place outpatients and their families in their community when they have available space. We have been working with Meridian to support our family housing offering since 2014. Jim Harris was a patient at Craig in early 2015 after sustaining a T2-8 and C2-3 spinal cord injury. While he was completing his inpatient therapy, his mother and father, Mary Pat and Jeff Harris had been living in family housing but were nearing the end of their available stay. They began searching for a local apartment for the rest of Jim’s inpatient therapy, as well as something they could all live in together while Jim completed an additional four months of outpatient therapy – but had trouble finding something that would be wheelchair accessible and comfortable for the short time needed. Thankfully, Brookdale Meridian Englewood came through for the Harris family. Mary Pat and Jeff moved in to an apartment on the 5th floor of the Meridian building and began meeting their new neighbors. Mary Pat got to know quite a few of the residents, and got involved with some of their activities. One woman was having trouble keeping up her garden plot at the Center, so Mary Pat helped her out. She also helped residents with their tablets and smartphones when they were having trouble, and even joined a group that met for coffee each day. “It was nice to have some ‘normal’ things to do – especially at a time where nothing really felt normal." The day Jim left Brookdale Meridian Englewood, several of the residents gathered to send him off, a true testament to the special bond he and his family created while staying there. 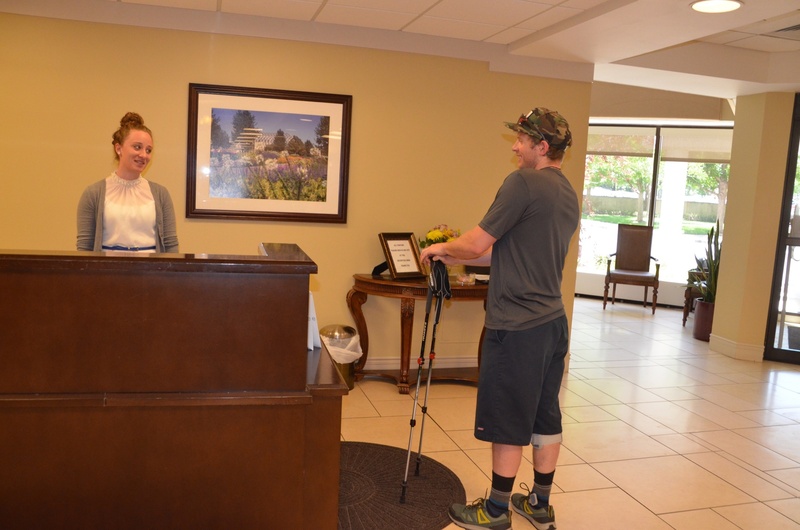 “Our relationship with the management and staff at Brookdale Meridian Englewood has been a tremendous benefit to Craig. They have helped us to provide stability and support to so many patients at a difficult time in their lives, and we are tremendously grateful for that,” said Rod Piel, General Manager at Craig.